When Nephi’s brothers were mocking him for attempting to build a boat, Nephi reminded them of the miracles the Lord worked for their ancestors when they wandered in the wilderness, after having been led out of Egypt (1 Nephi 17:17–42). As Nephi told the story of the brazen serpent, he spoke of “flying fiery serpents” (1 Nephi 17:41), instead of simply “fiery serpents” as found in the biblical narrative (Numbers 21:6, 8; Deuteronomy 8:15). 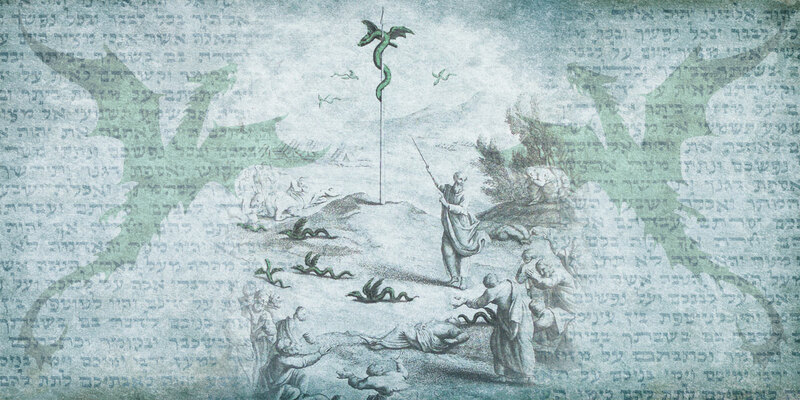 Although the biblical accounts of the brazen serpent in the books of Numbers and Deuteronomy do not mention flying serpents, Isaiah twice mentions “fiery flying serpents” (Isaiah 14:29; 30:6; 2 Nephi 24:29). One of these is in reference to “the beasts of the south,” (Isaiah 30:6), meaning the Negev desert—the very place where the Israelites were when the brazen serpent incident happened. In every case in Isaiah, Numbers, and Deuteronomy, the Hebrew uses seraphim for fiery serpents. This is the same word used in Isaiah 6 to describe the fiery, winged beings protecting the throne of God (Isaiah 6:2, 6; 2 Nephi 16:2, 6), leading many scholars to suspect that the seraphim of Isaiah’s vision were winged, serpent-like creatures. Winged serpents are commonly depicted on artifacts in Egypt and Israel from the eighth and seventh centuries BC. One noteworthy example is a stamp seal with a four-winged serpent, found in a seventh century BC home on the slopes of the western hill in Jerusalem. This region of Jerusalem was settled by refugees from the northern Israelite tribes in the late 8th century BC, leading some LDS scholars to believe that this is where Lehi and his family lived (cf. 1 Nephi 5:14–16; Alma 10:3). Most scholars believe that the “winged snake, cobra-like hybrid” depicted on these artifacts should be “identified with the Biblical saraf,” or “fiery serpent.” Some scholars even think Moses’s brazen serpent mounted on a pole was a winged serpent. When Nephi told the story a second time, he drew parallels between the brazen serpent and Jesus Christ (2 Nephi 25:20). Later Nephite prophets “saw the raised brass serpent as a prophetic metaphor for Jesus’ crucifixion” (see Alma 33:19–23; Helaman 8:14–15). Such associations make sense in light of the Israelite connections between the winged serpent and the Davidic king. Nephi understood that it was ultimately a sign of the Messiah—the true Davidic king. Kent Brown, “Brazen Serpent,” in Book of Mormon Reference Companion, ed. Dennis L. Largey (Salt Lake City, UT: Deseret Book, 2003), 171–172. Kent Brown, “Fiery Flying Serpents,” in Book of Mormon Reference Companion, ed. Dennis L. Largey (Salt Lake City, UT: Deseret Book, 2003), 270. Royal Skousen, ed., The Book of Mormon: The Earliest Text (New Haven, CT: Yale University Press, 2009), 54. The word order, with flying coming before fiery, is found in the original manuscript. See Royal Skousen, ed., The Original Manuscript of the Book of Mormon: Typographical Facsimile of the Extent Text, The Book of Mormon Critical Text Project, Volume 1 (Provo, UT: FARMS, 2001), 142, line 15. As it appears in Isaiah 14:29 and 30:6, the phrase “fiery flying serpents” (discussed above) is a translation of seraph meopheph, with seraph alone meaning “fiery serpent.” Assuming similar language underlies the translation of Nephi’s statement in 1 Nephi 17:41, the original word order, with flying before fiery, more accurately reflects the Hebrew. See Royal Skousen, Analysis of Textual Variants of the Book of Mormon: Part One, 1 Nephi 1–2 Nephi 10, The Book of Mormon Critical Text Project, Volume 4 (Provo, UT: FARMS, 2004), 369–370. The Hebrew term translated as south in the KJV is negeb or negev, and refers to the desert between Judah and Egypt. See Joel F. Drinkard Jr., “Negev,” in HarperCollins Bible Dictionary, rev. ed., ed. Mark Allan Powell (New York, NY: HarperOne, 2011), 694–695; Lynn Tatum, “Negeb,” in Eerdmans Dictionary of the Bible, ed. David Noel Freedman (Grand Rapids, MI: Wm. B. Eerdmans, 2000), 955. See alternative translations such as the NIV, NRSV, and JPS, which make it clearer that the Negev is what is being referred to. On the children of Israel being in this area during the brazen serpent incident, see K.A. Kitchen, On the Reliability of the Old Testament (Grand Rapids, MI: Wm. B. Eerdmans, 2003), 193–194. Other historical accounts also mention “flying serpents” in this desert region. See Wallace E. Hunt Jr., “Moses’ Brazen Serpent as It Relates to Serpent Worship in Mesoamerica,” Journal of Book of Mormon Studies 2, no. 2 (1993): 127–129. For a proposed candidate for the “fiery flying serpent,” see Ronald P. Millet and John P. Pratt, “What Fiery Flying Serpent Symbolized Christ?” Meridian Magazine, June 9, 2000. See also, Elder Glen O. Jenson, “Look and Live,” Ensign, March 2002, online at lds.org. In both Numbers 21:6 and Deuteronomy 8:15, seraph is used with nahas, “serpent,” where as in Numbers 21:8 and Isaiah 14:29; 30:6 it is simply seraph, which are clearly serpents in context. See J.J.M. Roberts, First Isaiah, Hermeneia—A Critical and Historical Commentary on the Bible (Minneapolis, MN: Fortress Press, 2015), 95–98; Marvin A. Sweeney, “Seraphim,” in HarperCollins Bible Dictionary, 935–936; William B. Nelson, “Seraphim,” in Eerdmans Dictionary, 1186; Matthew A. Thomas, “Serpent,” in Eerdmans Dictionary, 1188; Abigail Stocker and John D. Barry, “Seraphim,” in Lexham Bible Dictionary (Bellingham, WA: Lexham Press, 2016). Roberts, First Isaiah, 96–97, 226. Shlomit Weksler-Bdolah, Alexander Onn, Shua Kisilevitz, and Brigitte Ouahnouna, “Layers of Ancient Jerusalem,” Biblical Archaeology Review 38, no. 1 (January/February 2012): 40. Kitchen, On the Reliability, 52, 59; Mordechai Cogan, “Into Exile: From Assyrian Conquest of Israel to the Fall of Babylon,” in The Oxford History of the Biblical World, ed. Michael D. Coogan (New York, NY: Oxford University Press, 1998), 325; Steven L. McKenzie, “Judah, Kingdom of,” in Eerdmans Dictionary, 746; Israel Finkelstein and Neil Asher Silberman, The Bible Unearthed: Archaeology’s New Vision of Ancient Israel and the Origin of its Sacred Texts (New York, NY: Touchstone, 2001), 243; Charles H. Miller, “Jerusalem,” in HarperCollins Bible Dictionary, 447; Nicholas R. Werse, “Hezekiah, King of Judah,” in Lexham Bible Dictionary. Jeffrey R. Chadwick, “Lehi’s House at Jerusalem and the Land of his Inheritance,” in Glimpses of Lehi’s Jerusalem, ed. John W. Welch, David Rolph Seely, and Jo Ann H. Seely, (Provo, UT: FARMS, 2004), 87–99, 118–124; Brant A. Gardner, Second Witness: Analytical and Contextual Commentary on the Book of Mormon, 6 vols. (Salt Lake City, UT: Greg Kofford Books, 2007), 1:32; Brant A. Gardner, Traditions of the Fathers: The Book of Mormon as History (Salt Lake City, UT: Greg Kofford Books, 2015), 65–67. Weksler-Bdolah, et al., “Layers of Ancient Jerusalem,” 40. S. Kent Brown, “Brazen Serpent,” in Book of Mormon Reference Companion, ed. Dennis L. Largey (Salt Lake City, UT: Deseret Book, 2003), 172. I would think that fiery obviously refers to the poisonous bite. As for flying, if you have ever seen a snake strike, they don't just cozy up to you an nibble at your toes, they fairly fly though the air to strike at you. Walking through a land filled with snakes constantly leaping at you would surly inspire one to describe them as flying at you at every step. I don't believe the snakes had wings, any more than angels have wings. Wings are simply a metaphor representing movement. I've never thought of it until now,but Perhaps the fiery flying serpents were dragons. I can't think of anything else that fits the description. Dragons are mentioned in the Bible as well.